Sony is adding five new WUXGA resolution models to its family of laser light source projectors. Each is designed for a range of commercial mid-range installation applications including education, faith, corporate, and museums. The new models include the VPL-FHZ120L (12,000lm) for larger venues, the VPL-FHZ90L (9,000lm) for mid-sized classrooms, and the compact VPL-FHZ66 (6,100lm), VPL-FHZ61 (5,100lm) and VPL-FHZ58 (4,200lm). These new projectors grow Sony’s laser offerings to more than a dozen and take advantage of laser light source benefits, including increased brightness, ease of use, and installation flexibility. Each model uses Sony’s Z-Phosphor Laser with a blue laser as its light source complemented by a 3LCD optical system, to achieve the full spectrum of light and continuous, clear RGB color. 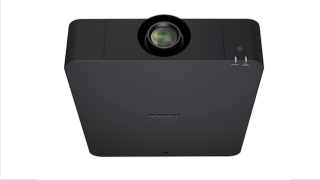 The five new projectors feature auto color calibration, a function that enables users to maintain the best picture quality over time and Sony’s instant on/off, which can be used to begin presentations at full brightness, with almost no warm-up/cool down time. The VPL-FHZ120L and VPL-FHZ90L use a newly developed LCD panel with enhanced light resistance, and for the VPL-FHZ120L, an optical compensator to realize high contrast that delivers stable brightness and high-quality image with vibrant color reproduction. The VPL-FHZ120L is designed for auditoriums and conference halls requiring AV solutions to support live performances and ceremonies. The projector fully covers sRGB, making it suitable for applications requiring precise color reproduction such as in exhibitions and museums. The VPL-FHZ90L is suitable for mid-sized classrooms or corporate meeting rooms, even those with challenging installation environments due to natural lighting or bright spaces with ambient lighting. This allows students and meeting attendees to take notes and review presentation materials while still clearly viewing the projected images. Both models also benefit from a new range of features including industry-leading wide lens shift capabilities and six lens preset positions for instant recall and enhanced usability. New HTML content display functions offer the ability to project customized content including logos, news, or advertisements via the network or a USB memory stick, even when the projector is on with no input signal. The three new mid-range WUXGA models—VPL-FHZ66 (6100lm), VPL-FHZ61 (5100lm), and VPL-FHZ58 (4200lm)—feature compact bodies designed for small to mid-sized rooms, while taking advantage of the full benefits of laser projection: long-lasting brightness, up to 20,000 hours of maintenance-free operation, and no need to replace lamps. All of Sony’s new models are compatible with the latest software packages such as Vision Exchange active learning solution, Display Power Management software and IP Remote App.